A technique to make sperm glow green could aid research into infertility, say scientists. An Oxford University team extracted a gene that manufactures a green protein in a jellyfish and used it to create green sperm in hamster testicles. Hamsters have similar sperm to humans and therefore provide an ideal model for studying human sperm development, and how things go wrong. Details are published in the journal Biology of Reproduction. The Oxford team say the technique should allow many different aspects of gene function in sperm to be analysed in close detail. It should be possible to highlight specific genes within the sperm using the jellyfish protein, and then to follow their progress. Lead researcher Dr John Parrington said: "Our real aim is to use this technique to study the function of genes that are important during fertilisation and that may cause infertility if they become defective. "That's an important goal given that a recent study found that one in seven British couples have fertility problems, and a third of these have an unknown cause." Many cells of the body can be cultured and genetically modified in the lab. But this is not possible for sperm cells because of their small size and unusual shape, and because they only live for a short time outside the body. The Oxford team plan to focus on the mechanism by which sperm entering an egg triggers it to develop into an embryo rather than remaining in a state of suspended animation. The technique may also offer the possibility of a new way of creating genetically modified animals for all sorts of other research. Currently, genetically modified mice are created by introducing synthetic genes called transgenes into an egg. However, this method is relatively inefficient, and so far attempts to use it to create genetically modified versions of important model species such as hamsters and guinea pigs have failed. Creating the transgenic animals from transgenic sperm - genetically modifying the sperm and then fertilizing a normal egg with it - might be the answer. Not only would it potentially reduce the number of mice used in medical research, it also opens up the possibility of studying gene function in species that are better models than mice for studying certain human diseases. 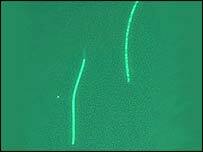 The fluorescent green protein only shows up in the mid-section of the sperm between the head and the tail. This is because the protein targets structures called mitochondria, which are only located in the midpiece. The fluorescence is only visible under a particular wavelength of light under a microscope. Dr Allan Pacey, a fertility expert based at the University of Sheffield and secretary of the British Fertility Society, told the BBC News website the research was an "exciting development". He said "This will allow scientists to examine many aspects of sperm function that would previously have been impossible. "There is an awful lot to discover about how sperm work and why sometimes they fail to function properly."